I have received some really good information from an acknowledged authority on East Greenland weather. Apparently there is another wind to be careful of other than the famed Piteraq. It is called the Neqajaq. 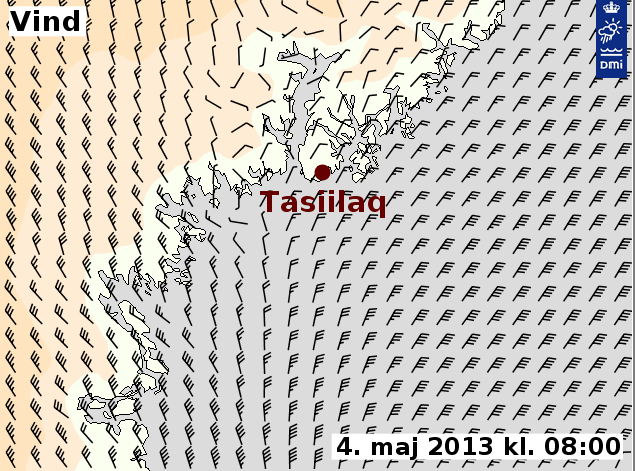 Unlike the Piteraq which is a fall, or katabatic wind, the Neqajaq is a barrier wind that blows parallel to the coast from the North East, often accompanied by bad weather in the form of rain and snow. It typically occurs ahead of a north moving low from South Greenland. It doesn't usually have an effect in the fjord system but it can produce heavy swells in the Denmark Strait which may impact my exit and entrance from Kong Oscar Havn where Tasiilaq lies. I have also learnt that the Piteraq is a north westerly blowing wind that occurs at the rear of lows moving northeastwards and understandably favours north east/south west running fjords. The winds are strongest nearest the ice cap. Piteraqs usually occur south of Tasiilaq in Koge Bugt but can extend up into the Sermilik Fjord very easily, less so to Tasiilaq. Below is a graphic showing a moderate Neqajaq blowing down from the North East past Kulusuk and a strong Piteraq blowing from the North West to the south of Tasiilaq.